Conversations With The Golf God by Robert K. Swisher Jr.
Every day around the world golfers wonder if the Golf God is real and how much he impacts the game. This book answers many age old questions. Yes, the Golf God is real! He appeared to local golfer Shanks one day, dancing on a bar at The Fleece Muni Golf Course and told Shanks he had been chosen to be his disciple. “Why have I been chosen?” Shanks asked, bewildered. “Because you are the worst putter I have ever seen and to continue to play the game you have to be filled with devotion,” answered the Golf God righteously. 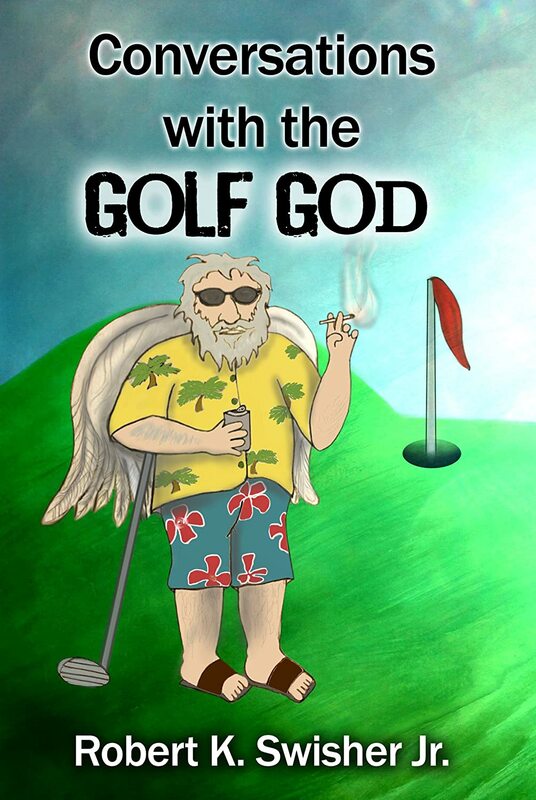 The Golf God also informed Shanks he had been assigned the task to write the Golf Gods’ legacy. In between beer, cigarettes, and pizza the Golf God told Shanks the real history of golf, explained the fine points of throwing a club, what golf terms really mean, why we play the game, and a few tips about putting, while Shanks shared several stories about real life golfers at the Golf God’s request – the kind who take your hard earned cash and lie about their handicaps. Grab a slice of pizza, have a beer, maybe a smoke, then sit back and feel like you are in the room enjoying the conversations between Shanks and the Golf God! 14 traditionally published novels – 6 indied. Wrote for newspapers and outdoor magazines. Filed Under: *Bargain Books Under $3, Humor - Nonfiction Tagged With: Robert K. Swisher Jr.